As I begin my third year in Christian higher education, I am constantly evaluating my teaching philosophy, meth0ds and strategies in the classroom. In the two years that I have been at Campbellsville Univ., I have taught 7 different graduate courses and 8 different undergrad courses. Each of these courses have required me to create and refine my teaching philosophy to that particular course. Most have been face-t0-face, but 6 have been hosted entirely online. I have had to learn, and re-learn, how to teach at the college level. Many of my students are not going into Christian ministry. Nearly 60% are seeking degrees in other fields but are required to take a basic Christianity courses as part of their general education requirements. These students must check my course off their gen. ed. list. For those who are not believers (roughly 40%), it is my responsibility and calling to share the Gospel of Jesus Christ clearly and openly with them. In the past 2 years, 6 individuals have made professions of faith in Jesus during my Religion in Life course. For those that are believers, my desire is to disciple them in their faith, building it stronger and not destroying it as other academic settings might. 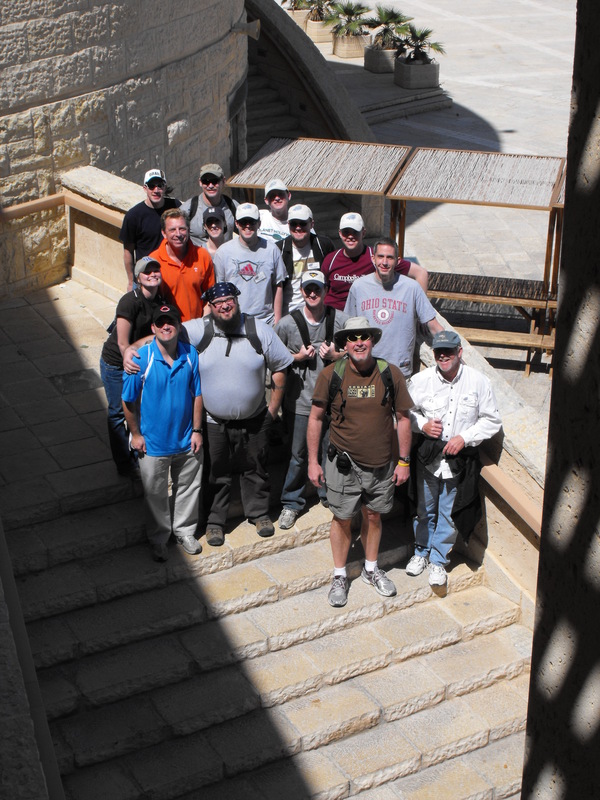 Group of students and faculty beginning our trek up Masada in Israel. For my Christian ministry students, my teaching philosophy is quite different. I see myself as a Educator/Mentor. I am their older brother in Christ, a fellow disciple, a minister of the Gospel just a few years down the road from them. Undoubtedly, I have to give them grades at the end of every semester. I have to determine if they have learned the content. But more so than anything else, I try to build deep and personal relationships with them. I want to know about their family, their romantic relationships, their church connection, their calling and God-given mission. These are the students who are regularly invited to our home. These are the ones that I go to coffee with. I stay after class and help them prepare an upcoming sermon or Bible study. I look over and edit their ministry resume. These are the students that I talk with about dating and marriage. My goal is to help them discover how God has uniquely designed them for a specific purpose and task in his kingdom’s work. Teaching is a calling. I love the calling God has given me. I deeply love my students and pray for them all the time. I see myself as one of their pastors. A guide and shepherd on their spritual journey. I believe they see my passion and heart-felt love for them, even if they disagree with my grading scale. Thank you for choosing to make an impact on the next generation of Christian leaders and disciples. I’m sure, with your enthusiasm for whatever you teach, your classes are the best on campus. The most exciting thing I saw in this post was the testimony to new members of our Christian family. Winning the heart of a collegiate for Christ not only changes them by the power of the Holy Spirit, but also changes the families they will also impact in the years to come…that is multiplication ministry and I am enthralled you are in the midst of it all! Pastor Bob, I could not agree more. Seeing new life in Christ in a classroom setting is truly a joy for me. One student professed Christ while taking an exam. Another while reading a book for a book review. Two others came to me after I presented the Gospel and asked how they could be saved. We prayed right there on the spot. Only in a Christ-centered university could such a thing happen openly.